Clinic Synopsis: Teaching the Whole Musician: how what we know shapes what we hear—a session for composers, conductors and performers. Tom Duffy discusses the brain and: an understanding of harmony and blending by making deliberate errors while performing; composing aural illusions (“optical illusions” for the ear); conducting poly-metric music (bilateral conducting); and ways for conductors and performers to identify and notate (and thus remember!) timbre relationships in ensemble music. 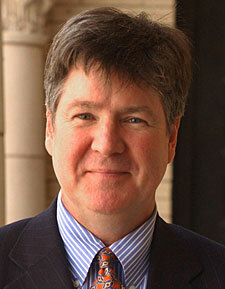 Clinician Biographical Information Thomas C. Duffy is professor of music and director of bands at Yale University. As past-president of the College Band Directors National Association, New England College Band Association, and Connecticut Composer Inc.; and a dean in the Yale School of Music, he has a record of leadership based on creative thinking and its conversion into definitive actions. His recent collaborations with the Yale Schools of Medicine and Nursing have resulted in projects that exploit relationships between music composition and properties of the brain. Reflecting the influence of his teacher, Karel Husa, Duffy pairs his musical compositions with issues that touch on the human condition, social concerns, or interweave with other disciplines. He composes music for all levels of the “musical food chain.” Recently he has created music featuring the bilateral conductor (different meters in each hand).